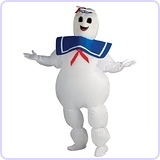 My boyfriend Josh is the Stay Puft Marshmallow Man. 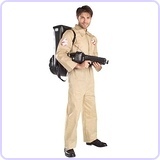 I am his forbidden love, the ghostbuster. 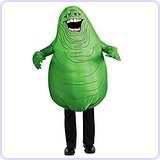 His favorite movie as a kid was Ghostbusters but there has never been any great costumes so we decided to make our own. To start off he took metal chicken wire and shaped it into a head and paper mached over top. 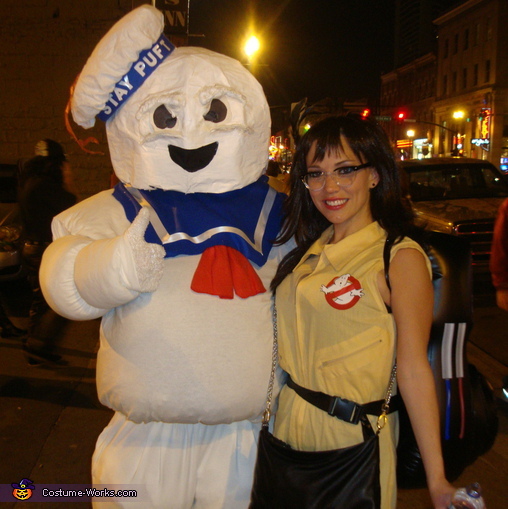 The stay puft hat has a base of cardboard with plastic bags stuffed into an old t-shirt. The body is a pair of XXXL pants and shirt from the goodwill that is filled with tissue paper and bubble wrap. To give the Marshmallow effect he used rubber bands. I drew the eyes and the mouth was cut out then speaker mesh was placed over it. My costume was a Large Man's Jumpsuit also found at the goodwill. I cut the legs and arms off and made it into a dress. I also made a homemade headband to go with it. In total we spent $35.00 on both costumes! !